Hi-Tech tends to conquer our contemporary world. While some people are already seduced by this progress, some others feel it is too intrusive. Indeed, some novelties can be alarming. “Augmented Human Being” – i.e. scientific contributions towards the expanding of individuals’ capabilities and senses through technology - could be one of them even if we still hardly can envision that and how it will happen for real. Many of us see this development as a loss of sovereignty. But still the majority will test it out and not only the few extreme hi-tech enthusiasts who tested the Google glasses as soon as they were launched. To be realistic, it’s just a matter of months or years before more prominent technologies see the day and it is going to be a big turn in our lives, so better to be ready. But fortunately, Hi-Tech companies have developed a new way to seduce us and make our fears fly away: beautiful fashionable designs! In fact technology is even pushing creativity within the traditional industry. Brands are forced to invent or reinvent themselves if they want to inscribe their signature in the future. The current flagship products are the super watches, already sharper in their appearance than a few years ago. No more plastic wristbands, but fine and clean metallic items. Have you seen how Apple promotes its Watch? Just as it is going to be the next thing on the fashion scene? 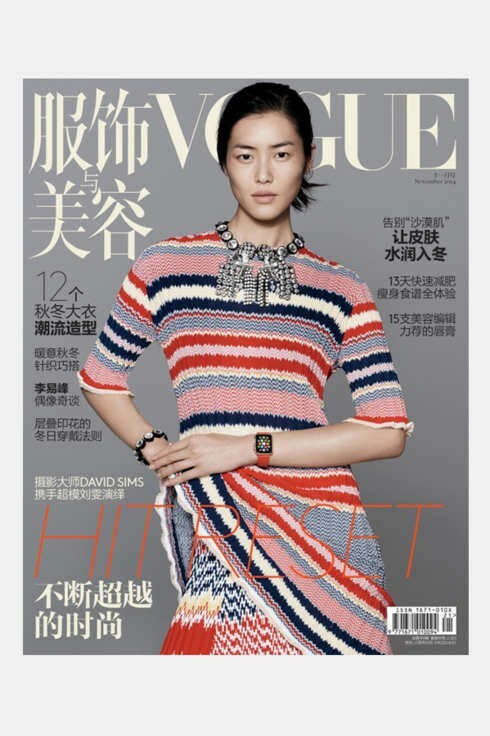 Recently, the Chinese VOGUE featured the well-known model Liu Wen wearing a Céline outfit and the 38-millimeter Apple Watch in 18-carat yellow gold and a 12 page ad was even dedicated to it VOGUE US. From sporty green band to rose-gold-accented face, offered declinations are many. The brand likes to think there is necessarily one for you. End of 2014, an unveiling event was hosted at Colette in Paris, during the fashion week, where Karl Lagerfeld and Anna Wintour lent their wrist to the device. In other words, the advertising campaign for the product is just the same as the traditional one for a fashion good. Happily (?) for the traditional Swiss watchmakers, the product won't be allowed for the time being at least, in Switzerland. The cause? Intellectual property rights. In fact, since 1985, the "apple" word and the image of the fruit has been protected by a patent. Another example of these fashionable technologies is the collaboration of Swarovski and the wearable tech brand Misfit. They together designed a set of chic fitness - and sleep - tracking jewelry. And this collection is really considered as jewelry. But we can ask ourselves if no matter how hard they try to embellish the perception of this product, it will ever become a stylish product for us. If yes, the Fashion Industry may soon have a disruption. The emblematic fashion brand will have to let some space for newcomers, who dare! Apple is not the only brand on the market and a sea of brands producing wearable tech is already booming. Recently at SXSW Festival and Exhibition in Austin, the first smart jacket has been presented. This jacket is linked up to Google Maps and tap you on the shoulder every time you needed to make a left or right turn. Even closer to your skin, Motorola is currently developing a stamp-sized circuit which will stick to the skin like a fake tattoo that will allow to unlock your phone. In a nutshell, hi-tech multiplies our experiences and skills. It will allow us to live many lives at the same time, to save some time to handle even more tasks. Will it inscribe permanently in the fashion industry?